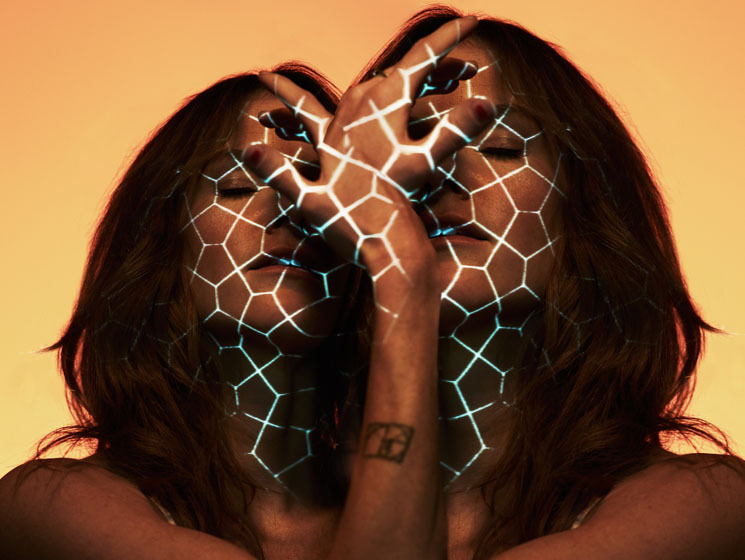 Experimental music's freshest pioneering synthesist, Kaitlyn Aurelia Smith, has delivered her fourth full-length, The Kid, and it's a heady concept album where each side of chirping, arpeggiating double vinyl represents a distinct stage in cognitive-emotional development: innocence and confusion, becoming self-aware, forging identity and reaching wisdom and peace in old age. Smith tells Exclaim! how she structured the album's instrumentation to reflect its four stages, the events in her personal life leading up to the creation of the album, how Pinterest figures into her practice, where she sees herself fitting into The Kid's developmental arc, and waxes enthusiastic about her success tracking down a rare hybrid synthesizer for the album. 1. Smith designed the compositional arc to reflect the album's existential development. "It's broken into four stages and it's a double LP so it's a stage per side, or you can listen digitally through the whole arc, and I wanted it to feel sonically heavier, darker, sludgier [and] more clumsy in the beginning and have a gradient as you go through the stages to finally reaching purely orchestral or lighter in colour and lighter in feeling of the rhythms — like more sophisticated arrangements," Smith explains. "As the album goes on, the compositions get more clear, more sophisticated and not as clumsy and spastic with their rhythms. In the beginning of the album, the orchestral stuff is still there, but it's very processed and hidden." Like Smith's critically adored 2016 full-length EARS, The Kid continues Smith's incorporation of voice and orchestral musicianship into her fantastical synthscapes, this time with arrangements for bassoon, cello, clarinet, flute and trumpet, working with the EU-based Stargaze Quartet. 2. The record was inspired by events in Smith's personal life. "It kind of just happened on its own. It was the subject that was presenting itself in my life at the time. I had someone really close to me pass away, and my dad has also been talking a lot about the four stages of life — he's writing a book about the fourth stage of life — and it's just been something that has been really curious for me. I also saw a movie two years ago when I started the album, [The Tale of Princess Kaguya], and it felt like it really woke up this urgency in me to be more playful in my life and not forget about enjoying the moment and that just became a really relevant theme in my life. "I guess I'm probably between the second and third stage. I think that's been something that's been on my mind a lot, because my dad's been talking to me about him approaching the fourth stage of his life; I've been asking myself where I am and I feel like I'm still in that stage of seeking everything for self-discovery, but I'm also starting to want to put a lot of my thoughts into, like, 'How can I use this self-discovery to make someone else's life better' and put a lot more energy into that." 3. Smith curated Pinterest boards to guide her through the writing process. Smith's known to compose to visuals in her head, but when asked about the images that drove the creation of The Kid, she revealed she made entire "treatments and Pinterest boards" to guide "the visual language and the colour scheme" of the album. "I call them texture ticks," Smith says. "I get these really intense urges to create a certain texture, and I'll just make this texture for a really long time and just gather it in folders. I really needed to make sounds that sounded like a giant shredded wheat being snapped, and so that's where it all started, and I just built on from there." 4. It's not an autobiographical record, but Smith says she inserted her present self at the end of the third side, on "Who I Am & Why I Am Where I Am." "I feel like we all have these moments of these glimpses into those feelings when we were younger, like, 'This is who I want to be, this is my essence' and then it's really easy to get pulled away from that by all the routines and day-to-day things and for me personally, I find that when I'm alone in nature, that's when I get my clarity of who I am and what I'm doing. So that piece I made after spending some time alone in New Zealand, and I wanted to create a feeling of lots of animal life around you. And I guess that's my personal part of it." 5. Smith's known for her work with the vintage 1973 analog synthesizer the Buchla Music Easel, but several tracks on The Kid incorporate the rare EMS Synthi 100 — a desk-sized analogue/digital hybrid synth. "I've played lots of analogue, modular, non-modular synthesizers, and the Synthi 100 was always the unicorn that I had been searching for, I think for multiple reasons. I really like movement and that's a big part of why I like using hardware synthesizers. It feels very cathartic and involved. So when I get to play a bigger synthesizer, it's even more so. And the Synthi — the EMS oscillators are something I've always been drawn to. Those and the EML and the Buchla synthesizers are all my favourite. So the Synthi 100 is just like playing four of those — four Synthis. And it feels like you're playing Battleship." "Who I Am & Why I Am Where I Am," was recorded in a single take on the Synthi, but according to Smith, the synth is all over The Kid. "It would [just] be really hard to point out where it is because there's so many tracks." And more Synthi 100 excursions are on the way: upon wrapping The Kid, Smith logged time at the National Music Centre's synth haven in Calgary, a productive artist's residency Smith says she emerged from with "a lot of stuff." The Kid is out now courtesy of Western Vinyl.